Authors: Dr. Maurice Said and Dr. Hayley Watson – Trilateral Research Ltd. In 2016, the UK Collaborative on Development Sciences (UKCDS) funded a study to map and visualise data on the distribution of disaster research funding in the UK. The data shows funded projects in disaster and crisis studies across UK universities. It detailed who was funded, for what, where and by whom. The data covered various funding agencies and programs but focused predominantly on the three main funders in the UK: Medical Research Council (MRC), Natural Environment Research Council (NERC) and Economic and Social Research Council (ESRC). It was used to populate a visual analytics mapping platform – the UK Disaster Research Map. 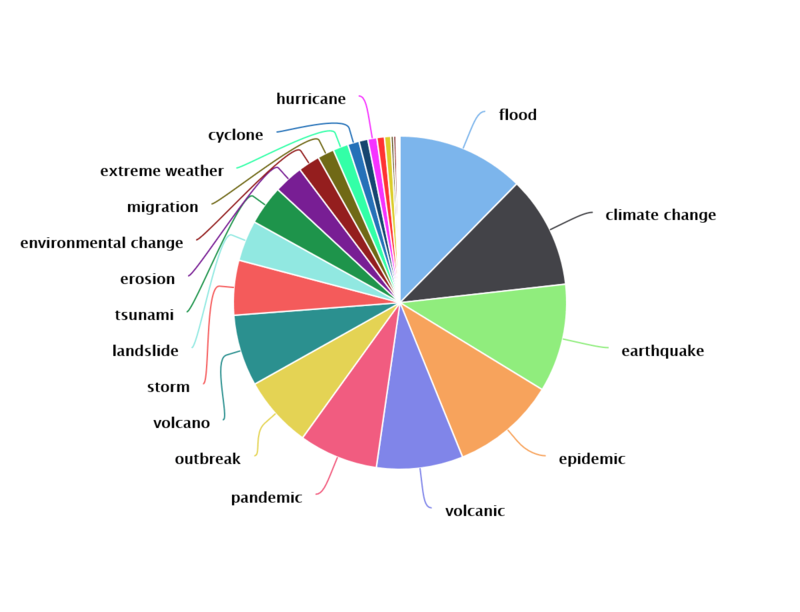 This will make it easier to gather, search and visualise disaster funding data, mapping academic research knowledge and capacity relevant to disaster research in the UK. The data covers funding awarded between 1976 and 2016 and a total amount of £370,196,882, with the MRC accounting for 53% of the total. However, it should be noted the bulk of funding data comes from 2006 onwards, since digital records are scarce or unavailable prior to this date. The study is a significant step forward in gathering and making available robust evidence about the status, research objectives and varying foci of disaster research studies in the UK. In this regard, the UK Disaster Research Map is a novel mapping exercise that is tailored specifically to disaster research to provide a holistic overview of UK funding. It has been noted that mapping research may be beneficial in identifying policy gaps (Bell et al, 2007), as well as providing funders with an added resource to better distribute funds and minimise waste in the allocation of funding (Nasser et al, 2017). The project also addressed a more significant issue, the provision of an evidence database and map to facilitate continuity in disaster research in the UK. Researchers and institutions will be able to identify what questions and problems are being addressed, reducing research waste and providing access to information on disaster related topics that can inform future directions in disaster research (Gerdin et al, 2014). It helps answer key questions, such as: Has this topic been tackled? What were the findings? And, how can future research build on successful projects to strengthen the body of evidence in disaster research? The UKCDS study is based on a constantly growing database of funding data that can be populated by research institutions and researchers involved in funded projects. This approach enhances its functions as a resource tool where data are validated by researchers and institutions. The pie chart illustrates how users can visualise relevant aspects of funded projects across the UK by hazard type, funding agency, location, time, discipline, methodological approach etc. Users can also filter their search down to very specific criteria that will aid researchers and institutions preparing new and innovative projects that will facilitate continuity with past projects, accumulate the evidence clearly, and build on an ever-growing body of disaster related evidence. Further information on the outcomes of the study will be released by UKCDS later in 2017. Declaration of Interest: Maurice Said and Hayley Watson from Trilateral Research, completed a study for UKCDS in order to understand and map the UK Disaster research funding landscape. The UKCDS are reviewing their options for the future maintenance of the Map. Dr. Hayley Watson, Practice Manager, Trilateral Research: Hayley joined Trilateral in 2012 and leads the crisis team. She has a background in research that examines the role of the public in preparing for and responding to crises through her work on the sociology of disaster. She manages several EU projects and tenders related to crisis management and security related issues (e.g., role of social media in crises, community preparedness, humanitarian protection and human trafficking). She has published peer-reviewed journal articles in relation to security and the threat of terrorism, as well as social media and crisis management. She has participated in a number of International conferences, as well as publishing in popular press. She is actively involved in the ISCRAM community (Information Systems for Crisis Response and Management) and co-chairs the ELSI track and working group on Ethical, Legal and Social Issues of IT supported emergency response. Hayley is one of the editors of the volume, “Digital Methods for Social Science: An Interdisciplinary Guide to Research Innovation” which was published by Palgrave Macmillan in 2015. Hayley is trained in research ethics and has an MA in Methods of Social Research and a PhD in sociology (relating to the public response to terrorism) from the University of Kent. Dr. Maurice Said, Research Analyst, Trilateral Research: Maurice joined Trilateral in 2015 and is a member of the Crisis Management team. Maurice has spent over a decade working and conducting research in disaster affected communities along coastal Sri Lanka. During this time Maurice worked as a volunteer, NGO staff worker, project consultant and field researcher. He has worked on numerous EU FP-7 projects dealing with irrigation, mining, migration, perceptions of Europe and, coastal development in the Mediterranean. His areas of expertise and research interests include post-disaster development, community resilience, politics and patronage, kinship, ritual, factionalism, suicide and self-harm, exoticization, narrative and participatory research methodologies. He leads Trilateral’s work on the FORTRESS (Foresight Tools for Responding to cascading effects in a crisis) and the DANTE (Detecting and analysing terrorist-related online contents and financing activities) projects and has contributed to research on tender projects for the GDPC (Global Disaster Preparedness Centre) and UKCDS (UK Collaborative on Development Sciences). His current research focuses on strategic alliances between political factions in post-disaster recovery. He is a frequent guest lecturer and speaker for the Network on Humanitarian Action (NOHA) and is widely published in peer-review journals. He has a PhD in Socio-Cultural Anthropology from Durham University. Bell, S et al. Mapping research priorities for green and public urban space in the UK. Urban Forestry & Urban Greening 6.2 (2007): 103-115. Gerdin M, et al. Optimal evidence in difficult settings: improving health interventions and decision making in disasters. PLoS Medicine 2014; 11: e1001632. Nasser M, et al. What are funders doing to minimise waste in research? Lancet 2017; 389: 1006-7.